A stronger second week in its new time slot for Flashpoint helped CBS finish in first place last night among households and viewers. Meanwhile, Fox still took first place among adults 18-49, but the return of Don’t Forget the Lyrics! caused the network to slip some among viewers and households, falling to second place in both categories, down one spot from the week prior. Click more to read my full analysis of the night’s ratings. CBS finished in first place for the evening with a 4.9/9 household rating/share and 7.34 million viewers, but was second place among adults 18-49 with a 2.0/6 rating/share. 8:00 p.m.: Big Brother 10 (4.2/8 HH rating/share, 6.45M viewers, 2.3/8 A18-49 rating/share). CBS really loves airing this show as many times a week as possible huh? Though off from its prior highs in years past, it’s been consistent this season no matter which night it airs on. It was up a slight 370,000 or 6% among viewers and 5% among adults 18-49 from this past Tuesday’s episode. More importantly, however, the series improved upon last week’s time slot occupant Greatest American Dog by an impressive 44% among adults 18-49. 9:00 p.m.: A repeat CSI: Crime Scene Investigation (5.4/9 HH rating/share, 7.94M viewers, 1.8/5 A18-49 rating/share. 10:00 p.m.: Flashpoint (5.2/9 HH rating/share, 7.64M viewers, 1.8/6 A18-49 rating/share). The second week in its new time slot proved positive for Flashpoint. The show rebounded from its slight down tick in viewers last week and grew yet another notch among adults 18-49. From the week ago numbers, the show was up 940,000 or 14% among viewers and 6% among adults 18-49. Of the four episodes that have aired thus far (two on Thursday, two on Friday), this is the show’s second best rating among all three categories, second only to its series premiere (5.3/10 HH rating/share, 8.13M viewers, 1.9/6 A18-49 rating/share). Looking at its retention numbers from its lead-in (96%/96%/100%), it’s obvious that the show is a natural fit out of CSI. FOX followed in second place for the evening with a 4.6/8 household rating/share and 7.15 million viewers, but managed a first place finish among adults 18-49 with a 2.3/7 rating/share. 8:00 p.m.: Don’t Forget the Lyrics! (3.7/7 HH rating/share, 5.85M viewers, 1.7/6 A18-49 rating/share). Returning from a more than two-month departure from the lineup, ‘Lyrics’ slipped by 800,000 or 12% among viewers and a rather steep 26% among adults 18-49. The declines could have certainly been attributed to viewers not aware that the show was returning, but regardless, the lower than average numbers from what ‘5th Grader’ did last week caused Fox to slip to second place on the evening among both households and viewers and nearly cost the network its A18-49 win. 9:00 p.m.: So You Think You Can Dance? (5.4/9 HH rating/share, 8.46M viewers, 2.8/9 A18-49 rating/share). The good news for Fox is that despite the weaker lead-in, Dance was unaffected and coasted to an evening win among all three categories, even from the week prior among adults 18-49 and up slightly among both households (+4%) and viewers (+80,000/1%). NBC finished in a tie for third place for the evening with a 3.0/5 household rating/share, and was alone in third among both viewers (4.63 million viewers) and adults 18-49 (1.7/6 rating/share). 9:00 p.m.: A two-hour edition of Last Comic Standing (3.2/5 HH rating/share, 5.00M viewers, 1.9/7 A18-49 rating/share). About the only positive thing worth noting for Last Comic Standing is that its makeup of viewers skewed younger than older, with around half its viewership within the A18-49 demographic. It also saw growth from last week’s poor numbers of 14% among households, 750,000/18% among viewers and 12% among adults 18-49. If it wasn’t for its solid A18-49 audience, it would certainly be labeled a loser. 9:00 p.m.: Fear Itself (2.6/5 HH rating/share, 3.87M viewers, 1.3/4 A18-49 rating/share). Though it posted positive growth from the week prior, that could just as easily be attributed to the larger tune in for its lead-in. Less than 4 million viewers in primetime and an A18-49 rating bordering at around the 1.0 level is just not acceptable. ABC followed in a tie for third place for the evening with a 3.0/5 household rating/share, but was fourth among both viewers (4.29 million) and adults 18-49 (1.3/4 rating/share). 8:00 p.m.: A repeat of Ugly Betty (2.6/5 HH rating/share, 3.75M viewers, 1.1/4 A18-49 rating/share). 9:00 p.m.: A repeat of Grey’s Anatomy (2.6/4 HH rating/share, 3.59M viewers, 1.2/4 A18-49 rating/share). 10:00 p.m.: Hopkins (3.9/7 HH rating/share, 5.53M viewers, 1.7/5 A18-49 rating/share). Though its numbers are still low, Hopkins has rebounded nicely from what was a very poor performance two weeks ago, growing another 6% among adults 18-49 this week from last (also +5 among households and +210,000/4% among viewers). The CW finished in fifth place for the evening with a 1.1/2 household rating/share, 1.63 million viewers and a 0.6/2 rating/share among adults 18-49. 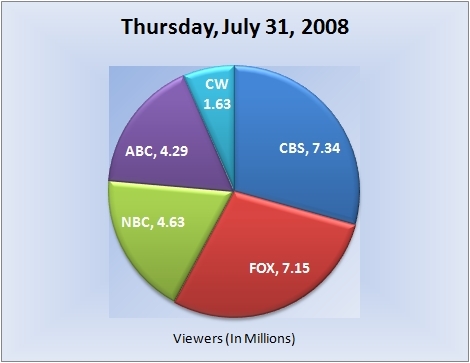 8:00 p.m.: A repeat of Smallville (1.2/2 HH rating/share, 1.71M viewers, 0.7/2 A18-49 rating/share). 9:00 p.m.: And a repeat of Supernatural (1.1/2 HH rating/share, 1.55M viewers, 0.6/2 A18-49 rating/share) ended the evening for The CW. Note: Network average numbers from the week prior are based on fast national data. Comparison’s from the week prior (or episode-to-episode, etc.) on specific shows are based on final national data. Ratings for the current day are based on fast nationals. (Expect all three scenarios to be the case at all times, unless otherwise noted). The final rating for first-run episodes that aired this evening will be reported the following week. So for example, the final rating for tonight’s episode of “So You Think You Can Dance?” will be reported in next weeks report for Thursday, August 7, 2008. Also keep in mind that because these are fast national ratings, numbers may increase or decrease when the final nationals are released. Sources: Fast/Final National Ratings Data from Nielsen Media Research. Daily ratings figures can be found at PIFeedback and Zap2It.